With one of the most desirable tropical climates anywhere in the world, South Florida has a vast number of family theme parks that are packed with visitors all year long. Not only do we have an abundance of amusement parks right here in Palm Beach County, Broward County, and Miami-Dade County, but South Floridians also are only a short car ride away from world-famous Disneyworld in Orlando. While these destinations annually provide millions of visitors with memories they most likely will treasure for a lifetime, accidents do occasionally occur on roller-coasters, bumper cars, rock-climbing walls, and other such attractions, that result in serious injuries and possibly even death. If you or a loved one has been hurt, or otherwise negatively affected as the result of a defective amusement park ride, we encourage you to call today the Law Office of Brumer & Brumer in Miami. Our attorneys have the experience and resources to identify the responsible party when an attraction malfunctions, leaving visitors with either short- or long-term physical, emotional, and psychological injuries. When the victim of an Amusement Park Injury retains the Law Offices of Brumer & Brumer, we begin an aggressive investigation into the exact cause of the injuries, why they occurred, and what could have been done on the part of the amusement park management or staff to have staved off the incident in the first place. Just as we do with all accident victims, our attorneys will communicate with every interested party -- other lawyers, the insurance companies, and management of the amusement park where the accident in question took place -- to ensure our clients' focus is on returning to full health. Brumer & Brumer has worked tirelessly for the last five-plus decades, winning tens of millions of dollars on behalf of accident victims throughout South Florida. We stop at nothing to ensure the rights of our clients are protected and they are made whole after a mishap through no fault of their own has occurred. 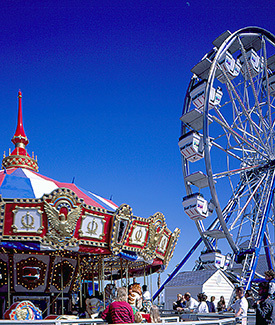 The causes for Amusement Park Injuries are many, some of which include: improper supervision; poorly maintained games and rides; malfunctioning or non-existent lap bars, seatbelts, and other safety restraints; other missing safety equipment required by local or state law; operator error; mechanical failure; and defective fundamental design of a ride. No matter what the cause, if you have suffered because of the negligence of an amusement park company, the Miami lawyers at Brumer & Brumer will ensure you are properly represented in your legal case. We will keep you apprised of all material developments as your case develops and provide the peace of mind you need to return, emotionally and physically, to the same quality of life you enjoyed before the accident took place. There is never an upfront, out-of-pocket cost to retain Brumer & Brumer. We will cover the entire cost of your case and we never get paid unless our clients do first.